You can access the full Kansas Employment Law Manual (over 50 state-specific reference resources) and Employee Handbook templates (over 10 statements state-specific handbook policy templates) below, as well as view key state and municipal deadlines, additional state-specific resources and links to key municipal coverage. XpertHR's Legal Timetable helps you keep track of key compliance dates in Kansas, as well as other states and municipalities. Does This Law Apply to My Organization in Kansas? In-depth review of the spectrum of Kansas employment law requirements HR must follow with respect to healthcare benefits. In-depth review of the spectrum of Kansas employment law requirements HR must follow with respect to FMLA. In-depth review of the spectrum of Kansas employment law requirements HR must follow with respect to involuntary terminations. Kansas employers seeking to educate employees about the availability of military leave and to demonstrate their compliance with Kansas's military leave law should consider including this model policy statement in their handbook. 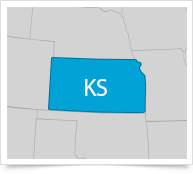 A round-up of the comprehensive state coverage XpertHR offers to help Kansas employers ensure they are compliant with state employment laws.